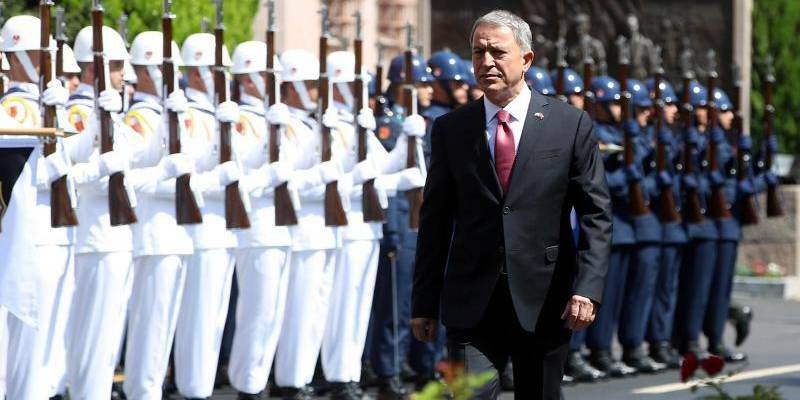 Turkish Defence Minister Hulusi Akar on Saturday reiterated Ankara’s rejection of any terror organisation along the country’s southern border with Syria, independent news site T24 reported. ‘’The existence of terrorist here, in any capacity, poses a serious threat and danger to our country and nation. As such, it is not possible for us to accept a terror corridor with a country we share a 911-kilometre border with,’’ Akar said while visiting soldiers with Chief of General Staff Yaşar Güler along the border with neighbouring Syria. Akar called on Ankara’s allies for fulfill their promises regarding Manbij. Ankara has repeatedly voiced frustration over what it says is the slow implementation of a deal with Washington to pull terrorists out of mainly Arab town of Manbij, located west of the Euphrates. Experts from Turkey and the United States have been working on a roadmap that will include every detail of the withdrawal from Manbij of fighters of the U.S.-backed Kurdish People’s Protection Units (YPG) since June last year. Turkey sees the YPG as on offshoot of the Kurdistan Worker’s Party (PKK), an armed group that has been in war in Turkey for over 30 years, and has vowed to destroy it. The YPG has formed the backbone of the U.S. war on ISIS in the region. Washington has announced its plans to establish a “safe zone” along the Turkey-Syria border to protect the YPG, following its December 2018 decision to withdraw from the region save a small number of forces. December 2018 was given as a deadline for the departure of the last YPG fighter from the city, but it has yet to be completed. “Müttefiklerimiz, muhataplarımızdan özellikle Münbiç’te verdikleri sözü bir an önce yerine getirmelerini bekliyoruz"